The new Apple Watch has been cleared by the FDA to sell as a low-grade health tracking device but is not producing medical grade data. At the event where the new iPhones were launched, Apple also launched the 4th iteration Apple Watch. Though it was not the focus of the event, Apple deservedly prided itself for being the first smart watch to pass FDA test. One feature highlighted at the presentation is, by combining the readings from the gyroscope and the accelerometer the Watch can tell when a user has tripped or fallen. If the user stays static after the fall for more than a minute, the cellular equipped Watch can automatically call for help from emergency service or reach out to the family or friend. This can turn out very helpful for the aging population. Another function of the Apple Watch being marketed is its capability to detect and alert the user irregular heartbeats which can be a symptom of a heart condition called atrial fibrillation, or AFib. This can also be a meaningful feature for a large user group: according to estimates by the US Centers for Disease Control, between 2.7 and 6.1 million people in the US have AFib, many of whom may not be even aware of it. Apple has conducted an “Apple Heart Study” with Stanford University, the findings of which became the basis on which it gained the FDA clearance. However the total sample size was small (few than 600) and the match rate with professional medical devices was not extremely high. But the data was good enough to convince FDA that the solution worked and it was safe. Apple Watch was given a Class II risk device category, meaning it will not be life threatening even if it does not work. In contrast, if a pacemaker stops working the patient will die, therefore it is classified Class III. In its approval file to Apple, the FDA demanded Apple to explicitly spell out the possibility of inaccurate reading as well as warn users that the is not a replacement for medical care, although the worst that can happen when the Watch reading is wrong is to cause scare for a healthy user. Therefore, the new Apple Watch can do the job of a low to mid-range electrocardiogram reader, but it is not a medical device. In a typical professional situation, a patient will have 12 reading leads attached to different parts of the body, including the chest and the limbs, to provide accurate reading. What Apple Watch can give is equivalent to one of them, on the wrist. No professional physicians will make judgement based on the reading on the Apple Watch. Any sensible users had better not either. Estimates from research firm Canalys put the number of Apple Watches shipped in Q4 2017 at 8 million, which is apparently more than the entire Swiss watch industry. Apple doesn’t break out its Apple Watch shipments publicly, so these are only estimates, but probably good ones as that’s Canalys’ day job. Furthermore there seems to be some consensus with IDC tweeting similar vibes ahead of publishing its hard estimates. Either way it looks like the latest version of the Watch is gaining some momentum. Business Insider had a look at the claim made in the IDC tweet about the Swiss watch industry and its official source of data, which seems to indicate Q4 2017 exports of Swiss watches in the region of 6-7 million. There are, of course, other sources of conventional watches but Apple does seem to be aiming more towards the luxury end. What to read into this trend, however, is far from clear. 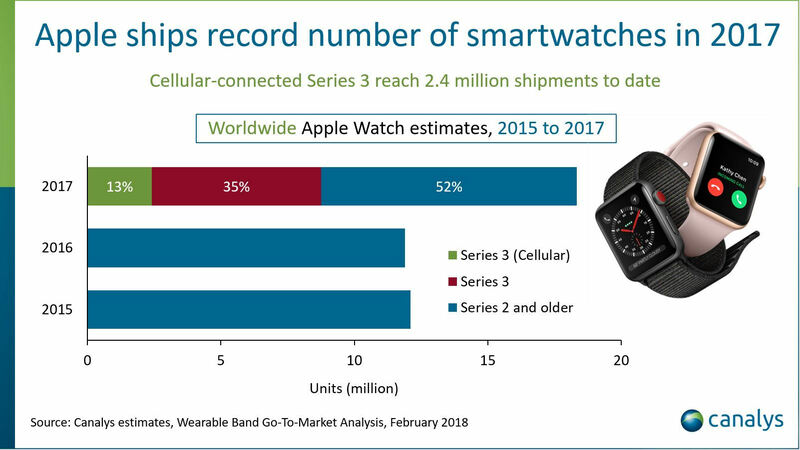 It’s not known to what extent the most recent shipments were influenced by operator bundling, nor how much more seasonal smart watch sales are than conventional ones. Furthermore Swiss brands such as Rolex tend to be very expensive and so should be expected to sell in lower volumes. The Canalys chart for the full year is below, which implies 100% of the Apple Watches shipped in Q4 were the new series. It’s interesting to note some traction for the modem-enabled ones since it’s unlikely many users will leave the house without their phone anyway, unless they’re going for a run. Apple has lined up its latest attempt to convince people there is value in smartwatches, but only if you are part of the lucky 32% who live in the right country, and have a contract with the right operator. It is supposed to be the smartwatch feature we’ve been waiting for: built-in connectivity. It’ll cost you £400, but only if you’re an iLifer. The fact it has to be paired with an iPhone is less of a surprise, but only one which has a contract from an MNO which is partnered with Apple. Analyst firm Canalys estimate 68% of iPhones around the world will not have the right contract in place to make use of the smartphone sensation. “The Apple Watch Series 3 is launching to a limited addressable market,” said Canalys Analyst Ben Stanton. “The total iPhone installed base currently sits at around 517 million. Of those, only 164 million are the right iPhones, with the right carrier, on the right tariff to work with the new cellular Apple Watch at launch. So who are the lucky few? In the US, it’s all the big players AT&T, Sprint, T-Mobile and Verizon, but the devices will not support UMTS on Sprint and Verizon contracts. Bell is the only one in Canada, but again, not for UTMS. And to complete the America’s (as in feature availability), AT&T, Sprint and T-Mobile are available in Puerto Rico. Again, Sprint does not support UTMS here. In Europe, the watch will only work properly in three markets; France, Germany and the UK. In France it’s on Orange, Germany its Deutsche Telekom and in the UK its EE. But once again, there in a blank column for UTMS in the UK. Switzerland has been noted for later in the year, but it doesn’t look like there is anywhere else for the moment. In Asia, Japan has three options; au, NTT Docomo and SoftBank, with only NTT Docomo offering coverage on UTMS. Australia has Optus and Telstra, with the promise of Vodafone later in the year. The final market in Asia is China, where only China Unicom is eligible, but only for mobile lines opened in Guangdong, Henan, Hunan, Shanghai, and Tianjin. Beijing is a notable omission. China Mobile and China Telecom are two which will come online towards the end of the year, though no details have been given. According to Ovum’s WCIS, that is 80% of the postpaid market missing right now, with China Unicom moving the wrong way in the market share rankings. It hasn’t been the greatest start possible for the iChief, which has already had the product criticized for connectivity issues, with the device holding onto weak wifi signal as opposed to transferring onto the stronger, and available, 4G. The iPrime has unauthenticated wifi, but of course it was never going to be a problem with the software. Of course there will be more partners and countries announced over the next couple of months, but it does seem to be a bit of a d*ck move from Apple. We wonder how many people will buy one only to discover their contract provider doesn’t support the device, or a lack of 4G coverage in their area means limited functionality. Reviews of the new LTE-enabled Apple Watch have marked it down for apparent connectivity issues, which Apple is blaming on unauthenticated wifi. Influential titles such as the WSJ and The Verge flagged up connectivity issues in their reviews of the latest watch. “I experienced cellular connectivity issues on three separate pre-production models, in two different states, on two different 4G LTE carriers,” said the WSJ. In other words it’s the old default-to-wifi issue that has plagued smartphone users for years but apparently hardwired into the device. We’ve all regretted signing up to wifi aggregators only to have our connection interrupted while the phone tries in vain to join a hotspot half a mile away, but mercifully we can manually ‘forget’ the network and free ourselves from this connectivity hell. Apple’s response seems to indicate that the default to any wifi in preference to LTE has been included in the firmware of the new watch. Not only is this annoying and apparently responsible for a poor user experience, but it seems to defeat the object of dropping an extra 70 notes on an LTE modem. This is a baffling move and Apple doesn’t seem to have said when the software fix will be available. Apple has finally unveiled the extensively leaked iPhone X ultra-premium smartphone but the $1,000 price point risks alienating many loyalists. Among the iPhone X headline features are a 5.8-inch ‘super retina’ display, which covers almost the entire front face of the device and which Apple somewhat snottily describes as ‘the first OLED panel that rises to the standards of iPhone.’ There’s a new SoC – the six-core A11 Bionic chip that Apple claims is 70% faster than the previous one and there’s ‘3D facial recognition’ which is supposed to be better than the current alternatives. As you’ve probably worked out for yourself the iPhone X naming is derived from the roman numeral for ten – signifying the tin anniversary of the exalted gadget. Apple clearly felt the need to make some kind of symbolic gesture and accordingly reserved most of its headline new features for the X, to the detriment of the iPhone 8 and 8 plus, which were launched at the same time. But at what cost? The X starts at $/£1,000 while the 4.7-inch 8, which doesn’t have the new super-duper display and facial recognition but does have the A11 chip, starts at $/£700 so Apple is charging a lot for that screen which, incidentally, is probably supplied by Samsung. This creates a real dilemma for iPhone users. Talking to a few of them after the launch the general feeling was not only that £1,000 is too much but that the very existence of the X significantly reduces the appeal of the 8 or 8 plus as they now seem like second-rate phones in comparison. The fact that the X isn’t even available until the end of October might make buying an 8 before then feel like even more of an anti-climax. Time will tell whether this is representative of broader market sentiment but Apple’s triumphalism has the potential to backfire significantly as loyalists opt to hang onto their existing phones for at least another year rather than either break the bank or upgrade to an iPhone 8 that doesn’t even feature many of the latest gizmos. Then again the X could be a massive success causing Apple’s $250 billion cash pile to grow faster than ever. Geoff Blaber of CCS Insight reckons the X is more indicative of a long-game from Apple. “The iPhone X is a long-term investment by Apple that sets a template for the next generation of iPhone hardware,” he said. “We expect OLED displays and the new design to become standard iPhone features for years to come. A staggered introduction of OLED technology and the new design enables Apple to steadily ramp up scale in its supply chain and maximise profits. The other significant announcement from Apple was the Apple Watch 3 which, as rumoured, is the first to feature an LTE modem. Among the additional cleverness is the inclusion of an eSIM that uses the same number as the owner’s iPhone, which will presumably be quite popular with potential Apple Watch buyers. But this doesn’t address the issue that has blighted the smartwatch category from the start: its limited utility. Until a genuinely useful new UI paradigm is created smartwatches will remain glorified fitness bands and the inevitable Apple price premium – the AW3 starts at £400 – makes a purchase even harder to justify. The final announcement was a version of Apple TV that supports 4K video, which was generally viewed as a catch-up move rather than anything new. There was disappointment that Apple doesn’t seem to have gained any ground when it comes to licensing content, let alone creating its own, and TV looks set to remain a ‘hobby’ for Apple for another year. 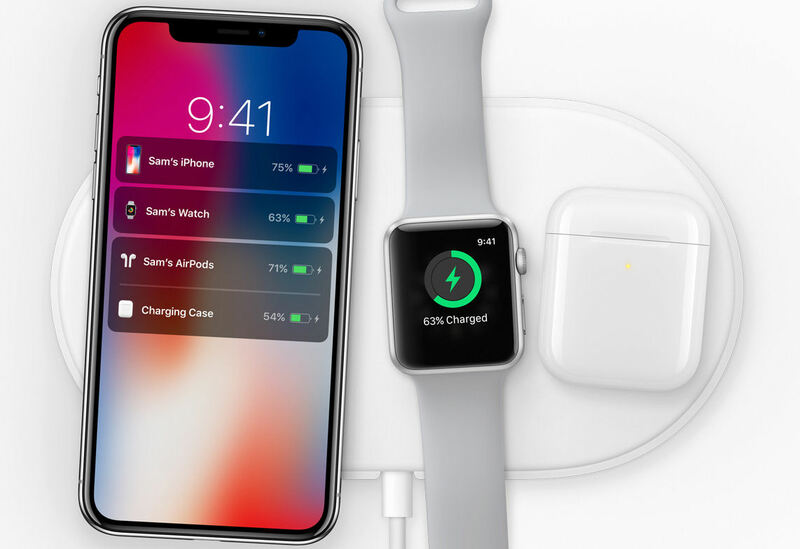 There was also a preview of an Apple wireless charging mat set to launch next year that will charge the latest devices and is unlikely to be cheap. Apple tends to experience a spike in sales when it moves to a new form factor as opposed to just a spec upgrade. This is one of those times, so on historical precedent alone this should be a successful launch for Apple. But the $/£1,000 price point is a significant PR negative for Apple right now and the creation of a new category could diminish the others further down the stack. If Apple creates mass-market tolerance for four-figure pricing then this launch will be viewed as a success, but that’s a big if.